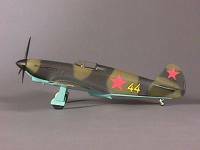 The AM Yak-1 kit consists of 99 injection molded parts. 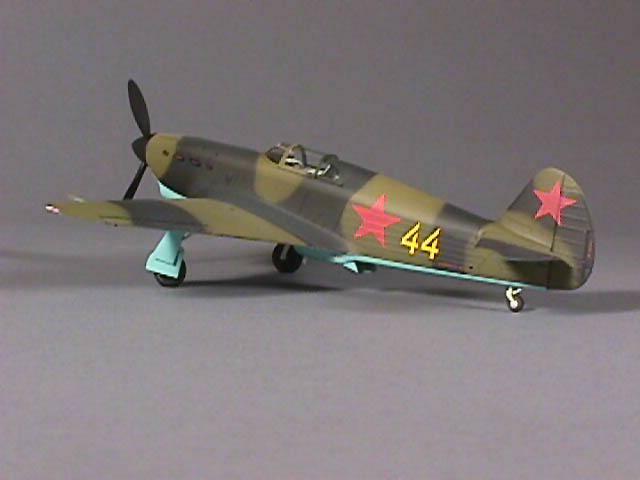 The Decal sheet provides markings for one aircraft: Lilya Litvyak's "yellow 44". The markings include 6 red stars with black outlines, the tactical numbers, maintenance stencils, seat belts and 2 types of decal for the instrument faces. The canopy is provided in 3 pieces. Both the early all clear and the late style rear canopy sections are supplied. 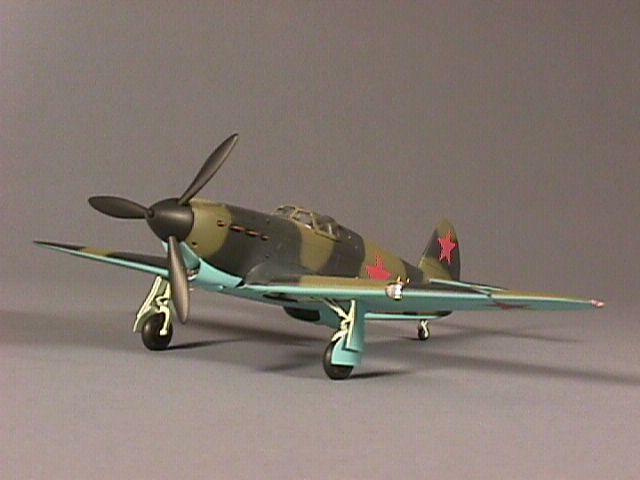 Optional underwing fuel tanks and rockets are provided. An optional set of weighted main tires is also included. Panel line and rivet detail is engraved except for the main landing gear doors which have some very fine raised rivets. The engraving is nice and crisp and will stand up to a few coats of paint. The rivet detail on the oil cooler and radiator scoops does not line up well when the main fuselage halves are joined. The representation of the fabric control surfaces and rear fuselage is reasonably well done. Fortunately, in my opinion, no attempt has been made to texture the fabric surfaces. The cockpit is built up from 14 parts and when installed, looks nice and busy. The instrument panel is molded in clear plastic. The instrument faces are represented by a decal which is applied to the back of the panel. This method produces a reasonably accurate glass instrument face effect, especially if the panel is thinned down from behind considerably before the application of the decal. 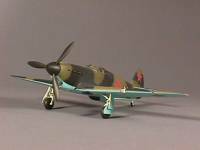 Ailerons are molded separately, and there is an option to drop the flaps if the modeler is not opposed to some minor cutting. A template is provided for pieces to blank off the wing if the flaps are dropped. The structural detail inside the flaps is a little vague. The landing gear is nicely molded and the optional weighted tires look very nice. The slight bulge is not overdone and looks accurate. Clear parts are used to represent the landing light on the leading edge of the port wing and the wing tip navigation lights. Clear covers are also included for the fuel gauges on top of the wings. The fit of most parts is excellent. Assembly is fast and for the most part, problem free. Some minor problem areas are the fuselage top and the scoop on the leading edge of the port wing. 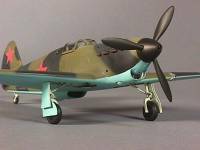 The upper fuselage was slightly too narrow to fit the lower fuselage properly. I solved this by gluing one side and allowing it to set up. Then I squashed the fuselage spine down until the other side fit, then applied glue and clamped it until it was set. It would be better to sand down the top of the lower fuselage parts until the width matched the top. The method I used caused the rear canopy to sit so low the pilot armor interfered with its fit. There is a gap at the rear of the fuselage spine, but this is easily fixed. The leading edge scoop fit somewhat poorly. Careful use of superglue or another suitable filler will take care of the gaps. However, the scoop looks a little small to me. The remainder of construction was trouble free. A model paint reference chart is provided which lists reasonable matches from most major paint manufacturers (with the possible exception of the interior grey - green listed for the interior color). 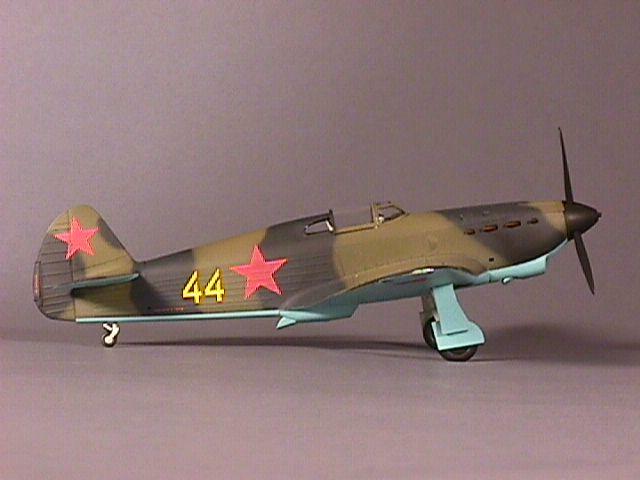 The scheme shown for Lytvyak’s “yellow 44” is not correct according to photos. I used the scheme shown for her plane in the article on this site: “The Development of Camouflage and Finish of the Yak-1 Fighter, Part I (1940-42)”. The decals are of excellent quality. The carrier film is extremely thin and completely disappeared when applied over a thin coat of Polly Scale gloss. They are very sensitive to Microsol but with care they work beautifully. 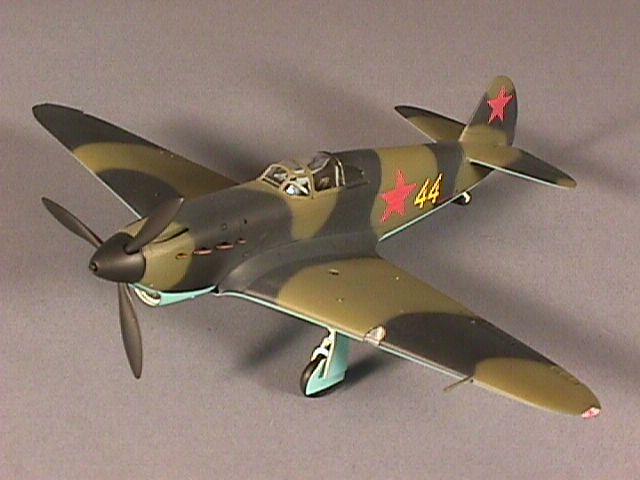 As far as ease of construction, level of detail and overall appeal this is an excellent kit. I cannot comment too much on accuracy because I have only a few pictures of the actual Yak-1. However judging from these pictures, the outline looks quite accurate. 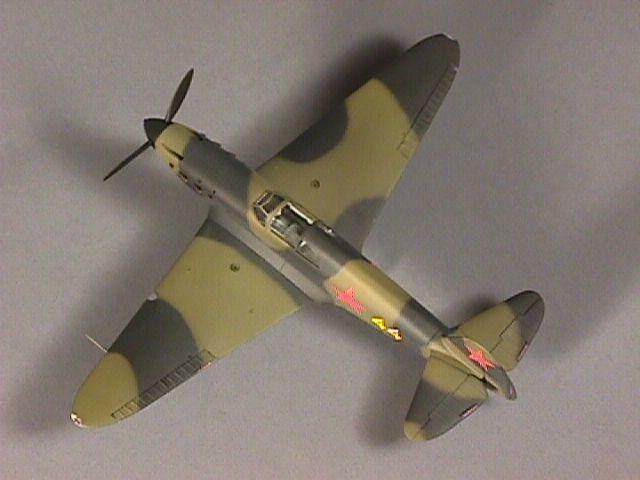 The kit was very enjoyable to build and the results are very satisfying. AM have released 3 versions of the Yak-1: #3423 “Yak-1 on skis”, #3424 “Yak-1” (the subject of this review), and #3425 “Yak-1b”. #3423 differs from #3424 only in the addition of ski landing gear (wheels are still included in the kit). 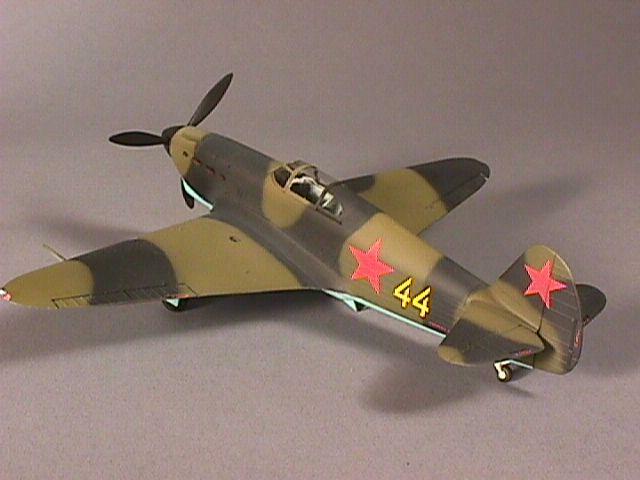 #3425 includes a new fuselage and canopy and other small details to make the later version.